Apartment built in 2004, located in Candelaria (Tenerife), about 20 kilometers from Santa Cruz de Tenerife. Located in a commercial area with wide avenues, near the bus station. Easy access to all kinds of shops and a variety of restaurants. Less than 200 meters from the beach and facing a green area. It has a pool, and optional parking. Smart TV, Internet, Wi-fi. 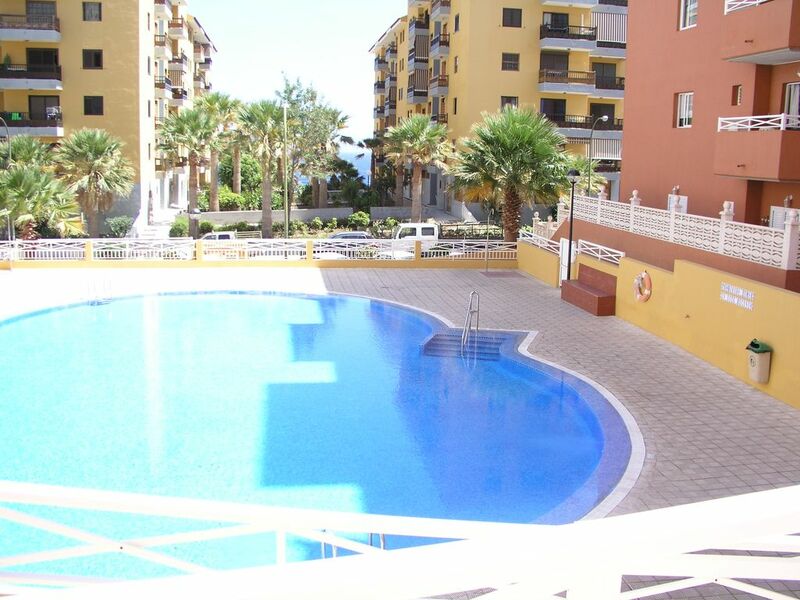 Apartment built in 2004, located in Candelaria (Tenerife), About 20 kilometers from Santa Cruz de Tenerife. It is located in a commercial area with wide avenues, near the bus station. Easy access to all kinds of shops and a variety of restaurants. Less than 200 meters from the beach and facing a green area. It has a pool, and optional parking. Smart TV, Internet, Wi-fi. The property is conveniently located within easy walking distance of shops and other services. This was our second visit and we enjoyed it just as much as the first time. Jaime,the owner, was very kind and helpful just as he was last time.The property is well equipped and maintained to a high standard.Thank you, Jaime. We had a very happy stay.Jaime the owner was extremely helpful and his apartment was very clean and well equipped. The sea is close and there is a nice prom which we walked on a lot.There are many cafes and restaurants. We also walked to the town of Candelaria which takes about 20 minutes,we are in our 60s.There is a shopping centre about 200 yards away with a well stocked reasonably sized supermarket. We hired a car and explored the area which we enjoyed but you could easily manage without one. There is a dedicated underground parking space and a lift up to the apartment which is on the first floor. The wifi is excellent and free. There is a flat screen tv but no English channels. Jaime brought us music and films to watch but we found we didn't need them as we had plenty to do. Perfect stay! Couldn't be any better! Mein Freund und ich waren für eine Woche auf Teneriffa und haben uns diese Unterkunft ausgesucht. Wir hätten keine bessere nehmen können! Angefangen damit, dass wir vom freundlichen Besitzer von der Bushaltestelle an der Autobahn abgeholt und am letzten Tag auch wieder dort hin gefahren wurden, war in der Wohnung Obst, Salat und andere Kleinigkeiten vorhanden - die Küche ist perfekt ausgestattet mit allem, was wir uns nur erträumen konnten, die Wohnung ist wunderschön (wie auf den Fotos), liebevoll eingerichtet und in direkter Strandnähe (max. 3min zu Fuß ). Wir freuen uns darauf, mal wieder dort wohnen zu dürfen! My boyfriend and I have been for one week on Teneriffa and decided to take that Apartment. And we couldn't choose a better one. We are looking forward to be there the next time. Hemos pasado una semana maravillosa, el apartamento estaba limpio y el regalo de bienvenida genial. We had a very nice stay at jaimes appartement. Its very well equipted, super clean and jaime was a very nice host. The communication and welcoming was warm and easy. we felt just like home! thank you for everything and all the best! Very nice, clean and friendly couple. They took great care of the apartment and its equipment, they left it very clean, and they were careful to comply with the local regulations. They are highly recommended. The town of Candelaria is located 20 kilometers from Santa Cruz de Tenerife, capital of the island of Tenerife and the province of Santa Cruz de Tenerife. In her streets with marine flavor and wide harmonized with modern facilities dedicated to leisure contrasting with the vegetation of the nearest mountains avenues are combined. For equidistant between the north and south of the island and its easy access to the TF1 highway, Candelaria is an ideal place to stay if you want to know the island. ideal for trekking through rural and traditional ways (www. lifeandtrekking. com) or relax in the sun on the beach of Las Caletillas in the black sand beach of La Arena or the artificial beach of Punta Larga place. View spectacular sunrises from the promenade of Punta Larga.